Environmental Justice strategies in the world of oil. With the progressive decline of oil resources, oil companies have responded to increasing global demand with new forms of technology, expanding the oil frontier into increasingly remote and inaccessible areas of the seas, Arctic regions, and tropical forests. These new extraction zones often provide lower quality oil at greater environmental risk and with disturbing social consequences. When affected communities stand up to defend their rights, they often experience forms of environmental racism, intimidation, and criminalisation. Many governments are ignoring or overriding the rights of indigenous communities and are thus violating laws they created to specifically protect these populations. On the bright side, the number of high-profile lawsuits demanding justice for environmental, social, economic, and cultural damages provoked by oil companies are increasing, as well as their media visibility. “Civil society is increasingly able to attract public attention to oil-related crimes, demanding the acknowledgement of human rights violations and environmental or ecological disasters caused by the negligent or malicious behaviour of oil companies.” Yet, these outcomes are only the beginning of the task to set precedents that will generate long-lasting, global change in reducing environmental injustices and guaranteeing compensation for damages. 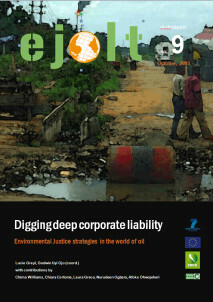 The report “Digging deep corporate liability. Environmental Justice strategies in the world of oil“ gathers first-hand information on experiences that support and promote an enhanced legal framework to tackle environmental injustice related to the oil industry. It aims at exploring the question of oil company liability and the agency of emerging Environmental Justice Organisations (EJOs) in putting forward their claims regarding socio-environmental conflicts. This report intends to provide greater understanding of oil conflicts and civil society responses in seeking environmental justice by providing a general description and an analysis of 6 cases that investigate aspects of corporate liability and important related lawsuits. The cases included focus on oil production in the Niger Delta and the Ecuadorian Amazon forest, oil extraction and petrochemical refining in Italy, and deep-water exploration in the Gulf of Mexico. Such a review of highly relevant lawsuits is helpful to recognise the scope and limits of procedural justice to achieve real advances for environmental justice, and to go deeper into the understanding of environmental crime in the world of oil. The report makes tangible policy recommendations geared specifically toward European political and judicial institutions, Nigerian and Ecuadorian governments, national governments in impacted countries, transnational companies, and to civil society. The recommendations address access to justice, legal obligations, transparency, and reporting. In sum, it recommends creating or strengthening international measures to enforce human rights, particularly in terms of environmental justice violations. To aid corporate compliance with these measures, companies should track the negative effects of their activities with mapping, for the purpose of minimizing remediating, and compensating for damages. Additionally, transnational companies operating overseas should adopt the same standards prevailing in their home countries and apply advanced corporate responsibility policies everywhere. In terms of transparency, it is imperative that companies are required to report on the social, human rights, and environmental impacts and risks of their operations worldwide. Without transparency, there is no accountability, and without accountability, enforcement falls to pieces. Advancing environmental justice through procedural justice can be accomplished in several ways, including defining and punishing environmental crimes, adhering to the precautionary principle, creating stronger precedents and case law, and, of course, building cultural change. Ultimately, this report highlights the key factors that need to simultaneously come together to eliminate prevailing environmental injustice. Read the full report and the policy briefing for a thorough analysis of corporate liability and environmental justice strategies in the world of oil. Authors: Lucie Greyl (CDCA) and Godwin Uyi Ojo (ERA/FoEN), with contributions from Chima Williams (ERA/FoEN), Chiara Certoma (CDCA), Laura Greco (CDCA), Nurudeen Ogbaraame (ERA/FoEN), Afoke Ohwojeheri (ERA/FoEN).